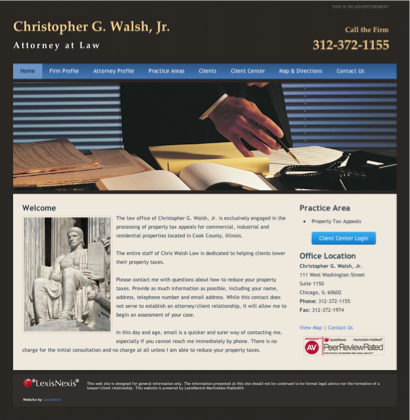 Christopher G. Walsh- Jr. (Attorneys) is practicing law in Chicago, Illinois. This lawyer is listed on Lawyer Map under the main category Lawyers - All in Attorneys. Christopher G. Walsh- Jr. is listed under Attorneys in Chicago, Illinois . There's currently no information available about fees or if Christopher G. Walsh- Jr. offers free initial consultation. The information below about Christopher G. Walsh- Jr. is optional and only visible if provided by the owner. Call (312) 372-1155 to learn more. I receive my property tax bill first installment need help, I know I pay to much compare with other propriety in my neighborhood also I leave in this house for 35 years, my husband is retired and here about all the exemption That is any way I can lower my bill.Thank you for your time. Contact Christopher G. Walsh- Jr. to find out about hours of operation / office hours / business hours. Listed business hours are general only. Call (312) 372-1155 to learn about office hours.